One of the great underappreciated Gregory Peck roles is his wonderful anti-hero character of Jimmy Ringo – the notorious hombre with a reputation as the fastest gun in the west, in Henry King’s “The Gunfighter”. Last year the art-western “The Assassination of Jesse James by the Coward Robert Ford” explored the mythologizing of the frontier gunslinger by the American media in the 19th century. In that film, Robert Ford, by reading comic book style story of the James Gang, grew up idolizing him. Of course, the trapping of celebrity caught up to him when Ford, once his loyal minion, became his assassin. “The Gunfighter” tells a similar story, although in a more straight forward manner. Peck plays badass hombre Jimmy Ringo, whose reputation precedes him everywhere he goes. Ringo’s supposedly killed 12 men, or is it 15, or 20? Ringo can’t step into a bar without being harassed by at least one wannabe ‘squirt’ looking to challenge Ringo’s name. This is what happens at the opening when Ringo unwillingly finds himself in a duel in a small town saloon. A cocky youth gets himself shot and killed, which forces Ringo to flee. Ringo goes to Chayenne but knows the murdered victim’s three vengeful brothers are hot on his tail. While in town he hides out in the local saloon with the barkeep Mac (Karl Malden) and his friend and local sheriff Marshall Strett (Millard Mitchell). When the town catches wind of Ringo’s presence it produces a Brangelina-like commotion. Some find Ringo a hero to look up to, some see him as a menace to society. Though he knows he should leave, his desire to reconnect with his old flame and young son threatens his life. Gregory Peck’s commanding presence make Ringo a tough yet vulnerable emotionally damaged anti-hero. We get enough of the back story to know that Ringo is a tired gunfighter, tired of having to prove his number one status as the fastest gun in the west. And when you’re at the top the only way to go is down, and as Sheriff Strett says, there is no second place in a gunfight. Peck’s solemn reactions to the gunslinging he’s forced to engage in creates a sense of impending dread. Peck knows his days as a gunslinger are numbered, that fate will catch up to him sooner or later. This makes his relationship with Peggy all the more desperate. If Ringo and can convince Peggy to leave with him, all can be right. The ending features a selfless gesture on Ringo’s part to help cleanse his soul and help stop the cycle of violence and death which his life has contributed to. I was reminded of the emotional and supremely dramatic ending to Michael Curtiz’s “Angels With Dirty Faces”, when Rocky Sullivan sacrifices his pride and reputation to save the Dead End kids. 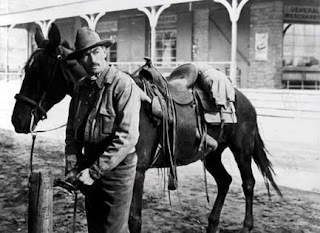 “The Gunfighter” is expertly shot by one of the great masters of cinematography – Arthur Miller. The Fox DVD features a respectful featurette on Miller and his other influential films. Check out this early Gregory Peck genre classic. Enjoy. While I personally have no idea why anyone would bother reading a review BEFORE they see a movie, I thought that your reference to Peck's extremely moving final gesture in The Gunfighter might border, if not entirely cross-over into the realm of "spoiler". Again, I don't think this should be an issue, but in this day and age, when people utilize reviews as consumer reports rather than critical analysis, I do think it's worth noting. Personally, I have no objection to "spoilers" since I am not boneheaded enough to read reviews of movies I have NOT seen. I especially agreed with your comparison to the ending of Angels With Dirty Faces and would, in fact, have enjoyed (and will, no doubt enjoy in person) a further breakdown and comparative snalysis between the two. I tried my darndest to be vague with the Angel-Gunfighter comparison. Re-reading it, I don't think I overtly spoiled anything. The finale of this film had to be mentioned, because it's so important to the film. Maybe I should have put a disclaimer at the beginning. Oh well. I would have loved to go into detail discussing the comparison with "Angels", but then I'd really be spoiling things. Don't get me wrong. I don't think you overtly spoiled anything either. However, if someone had seen or knew about the ending to Angels, they'd pretty much figure out the ending to Gunfighter based upon even the most cursory comparison. That said, I almost would have preferred a more detailed analysis because it would have saved me the trouble of re-watching both endings to do it myself. Wait a minute, that sounds like a blast! Your "spoiler" was extremely inspirational. And it will be fun to eventualy discuss the endings in person or on these pages at a later juncture.